Atalanta’s 5th place after nearly six months of Serie A is probably one of the most unlikely events that people could have predicted for this season. Definitely not the strangest, because of the arrival of Gian Piero Gasperini on the Nerazzurri’s bench after his predecessor Edy Reja had left the club at the end of the 2015/16 season, but no one could have imagined Atalanta fighting for European qualification. The former Genoa manager brought his 3-4-3 to Bergamo, building a structure which is both solid and creative. Atalanta’s main leader – and one of the most valuable players too – is Alejandro Dario Gomez, better known as “Papu”: Gasperini uses him on the left-side as an atypical winger, a few metres ahead of Jasmin Kurtic – whose role is that of an advanced midfielder, on the opposite side. Both Gomez and Kurtic are not used in their best positions, so it is usual to see different schemes during Atalanta’s matches. 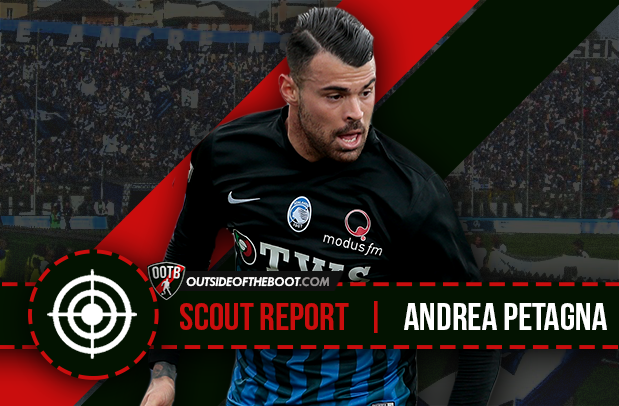 After considering Gasperini’s versatile organization, we have to insert Andrea Petagna within the framework to understand how his playing style influenced (and is still influencing) Atalanta’s season until now. Born in Trieste, Italy on the 30th of June 1995, Petagna began his career playing with the youth teams of a little club near his city, known as Donatello Calcio, and at the age of 14 he moved to another youth sector, definitely more famous: that of AC Milan. After winning two youth leagues in four years, Petagna made his debut with the first team at the age of 17, before being sent on loan: firstly to Sampdoria (Serie A), then to Latina, Vicenza and Ascoli (Serie B). Before he moved to Atalanta during last summer it seemed he had always been overrated, and that he would struggle to truly make the step up. When Gasperini and the Nerazzurri decided to buy him during 2016’s winter transfer market, and mostly when he arrived in Bergamo during the summer, Atalanta’s supporters were not convinced about the deal. At the beginning it was predicted he would have to fight with Aleksandar Pesic for a place, but after five matches (and a goal scored in only 24 minutes) he was promoted by Gasperini as the main forward of his 3-4-3. Since the away match against Crotone (in which he scored after only three minutes) Petagna has been part of Atalanta’s starting XI. Petagna’s numbers are not extraordinary if we simply consider him as a centre-forward whose only task is that of scoring, as he has scored only 5 goals in 21 appearences, but we’ll focus on this point in the following paragraphs. His career with the National team has not been brilliant either, as he has played only 25 matches (scoring 6 goals) with the youth teams and none with the Italian senior squad. However, it seems that in the following years Petagna could be a part of the squad, not necessarily as a protagonist but as a good backup for Ventura’s squad. Even if it will probably develop and change in details, Petagna’s style of play suggests we are talking about a real modern forward. He has always been employed as centre-forward. Petagna plays in the #9 role (although his usual shirt number is 29), but with a singular interpretation: Gasperini asks him to attack deeper spaces and offer passing options, a double task to which – sometimes – he adds strong pressing against opponent’s first phase of buildup. From a technical point of view it’s difficult to criticize him. Petagna has the best pass percentage between the other Serie A’s #9, including international stars like Gonzalo Higuain, Edin Dzeko and Mauro Icardi. And although it would seem absurd, the detail which surprises is not his first position in this particular ranking, but rather the fact that the disparity between Petagna and the other strikers mentioned above is relatively huge. In fact, while the average value is around 75%, the Nerazzurri’s centre-forward completes the 84% of his passes, the same as midfielders like Marchisio and Joao Mario. We have just talked about Petagna’s incredible pass accuracy, probably the attribute which makes him a real modern forward. He is 1.88 m (6 ft 2 in) tall and weighs 85 kg, but he’s not a static centre-forward who plays facing his back towards goal, waiting for a long ball from his midfielders or even from the defenders. He uses his physique to help in his team’s buildup: he can either work as a shield for his teammates by keeping the ball away from defenders, dragging them out of position and allowing his team to gain positional advantages in the final third (as a normal #9 should be able to do), or drop between the lines and the half-spaces to combine, receive laser passes from the back or the flanks and therefore take on defenders (he has completed 50 take-ons out of 74 attempted so far this season), just as in the two examples below against Chievo and Crotone. He is physically strong and also has great associative qualities, an often underrated detail which is important when differentiating a potential great forward from a good forward whose technique – for example – is more developed, but who does not have the tendency of playing collectively as required in a proactive style of play. Petagna is the second best centre-forward in terms of assists (5) this season in Italy’s top-light division behind Inter Milan international Mauro Icardi (8), and he has also provided 34 key passes and created 39 chances in Serie A this season. Numbers which underline his associative qualities, besides strenghts like selflessness, good relationships with his teammates and – last but not least – Petagna’s brilliant left foot, although he is comfortable with his right foot, as shown in the gif below of his goal against Lazio. When we analyze Petagna’s style of play in view of his old matches, both those during which his team suffered and those during which his team was qualitatively superior, there are mainly two points to underline. 2) Atalanta’s game is mainly based on passing chains and creating numerical superiority on the wings. The absence of a natural regista in the squad and the difficulties his team face when they play against compact and well organized teams can make him isolated from the rest of the squad. Even though he’s still very young, his low-scoring figures are a bit worrying: Petagna has never scored more than 7 times in a season (it happened during the 2015/16 season, when he played with Ascoli in Serie B), and as it stands, he averages one goal every 348 minutes, which makes it difficult for him to reach double figures. So, even if his performances are satisfying both Atalanta’s supporters and Gasperini, Petagna could end up developing as an incomplete centre-forward: employed in the role of #9, physically strong and technically valid, great in dialoguing with his teammates, but without that tendency to find the back of the net which is an essential attribute of a striker.